Should or can we move the Drunk Tank? Should we say Bye Bye Stars? Where do you Americans play? Know you will do what works for you guys ..just a shame some of us can.t take part.. I'm hoping that someone knows a place where we can all play for cash ? playing all the time just for play money does get to some folks I have heard. Perhaps unfortunately (since SOME Tankers still can't play real money games there) 'Starz is still the biggest house on the strip, so that's where (almost?) all of us already have player A/C's. IMO, their Private Home Game Club interface is also fairly well engineered. Speaking for myself, I'm not worried about not being able to play real $ Tankers-only tourneys, and I'm in no hurry to be generating extra rake for them by doing so. 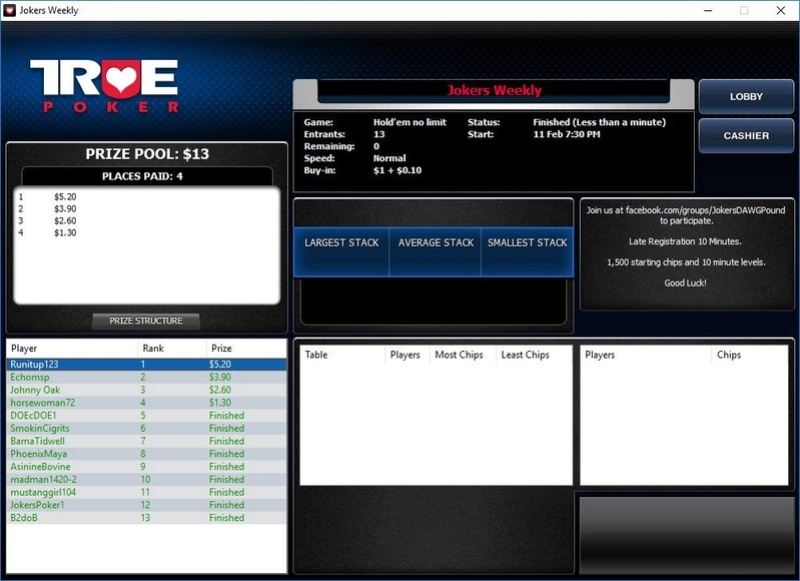 888 is the only other online Poker site where I have a player A/C, and I wouldn't sign up and deposit with any new provider, for no other reason than being able to play real $ Tankers tourneys. Since you asked, that's my Robert & Robert (2 Bobs) worth. What method of deposit did you use? I used a credit card. I remember the first one I used was not allowed, but tried a different one and it went through. The minimum deposit (I think) was $25, so I didn't think that was a huge risk. Now I have yet to try and withdraw any money, so I have no idea how difficult that might end up being. The software seems like it works all right. Except it doesn't have a button to allow me to match the pot, I hate that, but so far that is my only complaint. Add a reply to this thread if you would be interested in ME pursuing this, and if you think we should join Joker's group, (which would be the easiest thing to do) or form our own group (which is more work, but doable). I play on the ACR skin and use bitcoin, it's very easy to deposit and withdraw via bitcoin if you're in the US. I can post instructions if that might help should you decide to go that direction. Note I'm not 100% sure if the True poker skin uses bitcoin or not. ACR does and I think Black chip as well, same ownership. Canadians should have other options as well like Neteller etc that don't take US residents. wetmoose can probably shed more light as he plays on the network regularly. Looks like everything has been said well enough already. 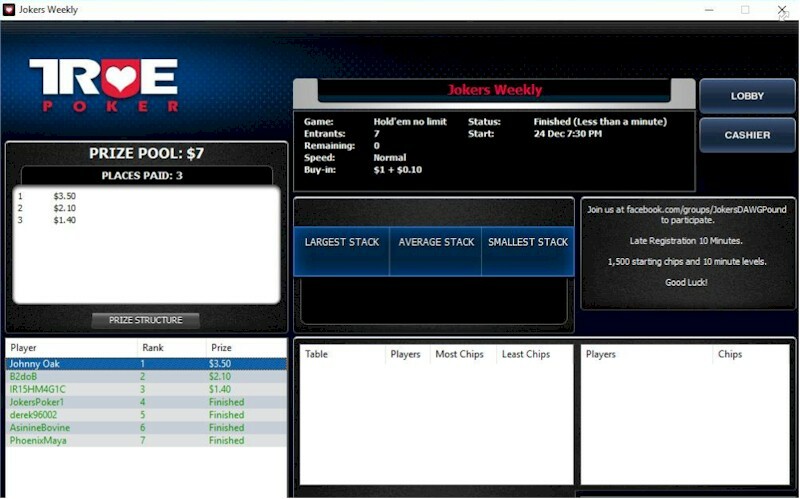 I have been managing an affiliate group that is on TruePoker nowadays for 3 years now. I give the money made back to members and it has been a wonderful small group. I also host a game every Saturday that is open to anyone and can be played from AmericasCardroom, BlackchipPoker, and TruePoker. I post the password every week in my Facebook group Joker's DAWG Pound among other places intermittently. I have used WesternUnion before to deposit but was flag when I tried a second time so these days I have a bitcoin wallet at BlockChain because it has no fees or software you need to download. Money goes into the account in 30 minutes. My only withdraw was by check and it took 10-12 days to get to me by mail. I would assume using my bitcoin wallet next time will be extremely fast, within hours is what I hear. Everyone is welcomed to join us and if an account is needed I would ask to consider joining my affiliate group. I believe in power by numbers and feel a consolidation of efforts would be best for everyone. As stated I keep nothing and give all the money back to players and have been doing this since day one. Either way it's up to you guys and Effsea of what you chose. I'm here and would be honored to have this great group join in either our weekly game and/or my affiliate group. Come find me on Facebook, Jason Sebastian Julian. I will send you a friend request on fb. I only have an account on ACR, but have access to play on Joker's True Poker site. Not sure how he sets that up so other sites can play there, but it works fine. I trust the ACR site and they have lots of low limit cash games. I would assume using my bitcoin wallet next time will be extremely fast, within hours is what I hear. They will tell you 24 hours and I've had a couple take that long but usually faster, the fastest was about 4 hours. Bitcoin rocks. Adding the bonus code simply adds you as an affiliate to Joker's Club. It is not a requirement, but it does allow him to offer a kickback (in the form of freerolls and small payouts) to his members. It costs you nothing, and helps him. Like he says above, he gives it all back. I will look into this after our move, we only have 27 days left in Scotland and it will take a short time to get settled in Gibraltar but I hope to be able to join in with this once the fog has cleared and my head settles down. Meantime enjoy and it would be great for a bunch of Tankers to get involved just like the old days.Take care everyone and good luck. I guess that my BCP account is good for those,right? Remember that the Joker's Poker tournament is played on Saturday night at 8:30 EST in the True Poker (or any of it's affiliates). There are already 3 Tankers playing but more would be welcomed. Buy In is $1.00 and it is password protected. If you need the password send me a PM with your screen name. We had another Tanker join us last night. GTCU Joe. Here are the results of the Saturday night money game. Wish we could get more Tankers to play. I wish we could get more players from this club to join the Saturday night game. We had two Tankers In The Money this week. This weekly game is starting to look like a Tanker reunion. Three of the top four were DT alumni. If any of you are members of True or ACR you can play. Would love to see you there.